Using coconut water for hydration during and after running is a healthy alternative to regular sports drinks. It is a natural sports drink because it can be used to replace the electrolytes you lose through sweating. Coconut water provides excellent hydration and boosts energy. It has a high mineral content and is a rich source of numerous other nutrients. It has a particularly high potassium content. In fact, so high that you can use it to replace bananas as your recovery food. One cup of coconut water contains about the same amount of potassium as two small bananas. 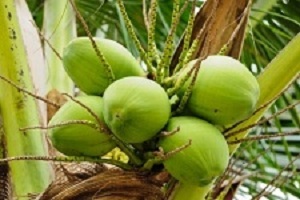 Coconut Water is the water extracted from young coconuts from the coconut palm. It cannot be obtained from mature coconuts. As the nuts mature, the coconut water gets replaced by the coconut meat and air. You can identify young coconuts as they are still green or you may see them with only a white husk and a conical shape on top if the outer shell has been removed. The mature coconuts are brown and have a hairy covering. Contrary to what some believe, coconut water is not the same as coconut milk. Coconut milk is derived from the meat of mature coconuts. Coconut water is unique as it has an electrolyte profile that is so similar to human plasma that in emergency situations doctors have used it intravenously to treat dehydration. Using coconut water for hydration is a wise choice for everyone -- not just runners. It is a pure and natural liquid and it contains many health enhancing properties. It is high in antioxidants and contains natural anti-ageing compounds. It is a natural diuretic and includes detoxifying properties. Using coconut water for hydration will help keep your electrolytes balanced during and after running. It is a good choice for a sports drink because it is rich in potassium and sodium (see the total nutritional breakdown in the table to the right). Coconut water has so many health benefits. It enhances the immune system and balances PH levels in the body. It helps control cholesterol, aids digestion and aids in urinary tract problems. Because it is such a pure and nutrient-rich liquid, it has been used to treat children who have lost electrolytes due to vomiting or diarrhea. Coconut water can be used as a laxative and it helps soothe infants. Coconut water is readily available in the tropics where it has been used for many purposes other than re-hydration. It has been used to dissolve kidney stones, kill intestinal worms, remove toxins from the blood and to boost libido. Coconut water has been known to increase libido for both men and women. Coconut water has also been used to help glaucoma sufferers. When consumed, it reduces fluid pressure in the eye. It has also been used to treat cataract. Drinking coconut water for hydration during and after running is a natural choice that includes so many other benefits -- it's not just for hydration!